Nearly every business has a basic strategic plan. Yet, once that plan is in place, they rarely re-examine their process about how to re-vamp, re-engineer, and re-innovate their plan to create game-changing results. MANY companies (and strategic planning facilitators) spend too much time REVIEWING THE PAST, rather than FOCUSING ON THE FUTURE. “Innovation” ranks HIGH on most corporate values lists, but when it comes to their strategic planning process, they’re still stuck using outdated tools (i.e., S.W.O.T. ), inefficient techniques, and boring meeting formats. 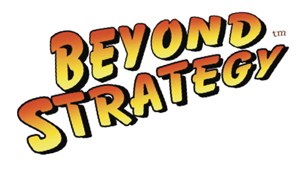 We help you re-think, re-invigorate, and re-engage your strategic planning process to go Beyond Strategy™. Our facilitation approach serves as an “early stage module” within your overall Strategic Planning process that will help your team look at your problems, challenges, and opportunities through a different framework. As your strategic planning facilitators, we focus on equipping your people with the mental tools and innovation resources they n.eed to engage and create change pro-actively and positively. Your Return on Innovation (ROI) comes as they generate innovative ideas, develop creative solutions, discover game-changing strategies, and capitalize on emerging opportunities for your High Stakes Issues, Million Dollar Problems, and Fast-Breaking Opportunities. How much would it be worth to re-think and re-vision your strategic planning process in order to move beyond strategy to tangible actions that generate game-changing results?